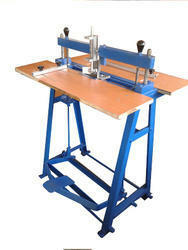 Leading Manufacturer of ajya round corner cutting machine and double round corner cutting machine from Mumbai. Also used for Single Line creasing,Index Cutting,Perforation. Multi Purposed Machine can be used for some other operations. Easy to change Die Set takes less time for change over. For Cutting Two Round Corners in One Stroke. Both Corner Cutting Die Distance Adjustable. Fully covered Machines for safe Operation. Die Distance can be change easily. Looking for Corner Cutting Machine ?